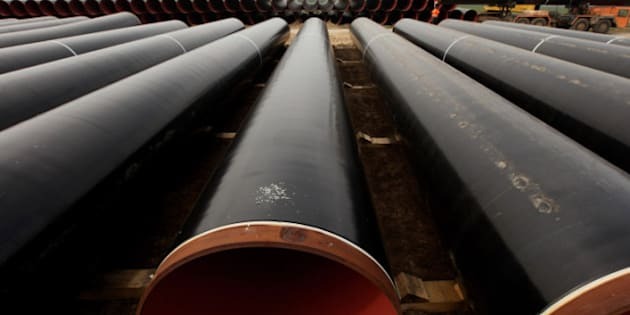 Instead of competitive fedora'd gunsels from the Plateau Mont-Royal hustling truckloads of illicit booze through the New England night, and tommy-gunning each other on the approaches to Rutland, this time it's TransCanada's Keystone project threatening spillage and spoilage of precious ecozones in Nebraska. New Yorkers, we are among you -- we Canadians -- though you are usually unaware. Unless, perhaps, it's the season of Stanley Cup Finals -- usually a torpid June week in Manhattan -- and you notice loud, polite groups of us in neighbourhood bars, cheering on our Vancouver Canucks, Montreal Canadiens, Toronto Maple Leafs, Ottawa Senators, or our freshly-minted Winnipeg Jets, against one or another team of hireling Canadians decked out in the garish jerseys of some sunbelt city where ice has never been produced by natural means. By the way, what do you say to six drunk Canadian defencemen to persuade them to quietly exit the hotel's hot tub? Try, "Can you get out of the hot tub now, please?" Works every time. Do not forget the "please." Oh, we are nice. We weren't always. "Canadian gangsters" may seem an oxymoron, but in the days of your prohibition, squads of us made serious moola and some gunplay while pouring our excellent rye whiskey over the border into backwoods Vermont then down the spout of U.S. Route 7, to be shaken or stirred in the highball glasses of Gatsbyesque Manhattan. In fact, Fitzgerald hinted that Jay Gatsby himself was likely one of our cross-border affiliates. New York City has always been a mecca for us. Back in 1892 the Times was waspishly editorializing (p4, column 4, June 6, 1892) on the dastardly threat posed by emigrating French Canadians ("It is next to impossible to penetrate this mass of protected and secluded humanity with modern ideas or to induce them to interest themselves in democratic institutions and methods of government.") And Joseph Mitchell's 1949 New Yorker piece, "The Mohawks in High Steel" noticed the Caughnawaga Mohawks -- their reservation is across the river from Montreal -- colonizing the North Gowanus neighbourhood, in Brooklyn, where saloons stocked Canadian cigarettes and Molson ale, and a local pastor was struggling to learn the Iroquois language. These days, your rulers in the White House and Congress wrestle with the evils of importing another nasty Canadian liquid -- oil squeezed from the Alberta tar sands -- through another, possibly violent, delivery system. Instead of competitive fedora'd gunsels from the Plateau Mont-Royal hustling truckloads of illicit booze through the New England night, and tommy-gunning each other on the approaches to Rutland, this time it's TransCanada's Keystone project threatening spillage and spoilage of precious ecozones in Nebraska on the course of its long run from Alberta ("Where?") to the Gulf Coast. Well, we Canadians do recognize a business opportunity, and your addiction to high old times -- always cut with pure grains of zealous Puritan rectitude -- usually allows us to deliver our goods, or ourselves, and at a premium, once the hot air cools. You may not want us, but given your insatiable appetites and addictions, America, you're probably going to need us.